Roses are really just specialized shrubs, so planting them in your garden is similar to planting other trees and shrubs, except for a few additional considerations you need to remember. Check that the roots are moist. Select plants with the largest canes (at least 1/2 inch in diameter). Select plants that aren’t leafing out yet. To get an accurate idea of the flower color, you can look at plants with a few open flowers as well. After you bring your new rose home, you want to plant it in a convenient location as soon as possible. If you can’t plant until a few days later, store your bare root rose in a cool, dark location, or place your container rose in a partly shaded location and keep it well watered until planting time. Choose a site in full sun (at least six hours a day) on well-drained soil with a near-neutral pH (6.5 is ideal). If you’re planting a bare root rose, unwrap the rose and soak the roots in warm water for one to two hours before planting. Dig a hole at least twice the diameter of your container rose or the spread of your bare root rose. Loosen the soil along the wall of the hole to encourage the rose roots to grow into the native soil. In cold winter areas (hardiness zones 3 through 5), dig the hole deep enough to bury the graft union (the bulge in the rose stem located just above the roots) 3 to 5 inches into the soil. In warmer areas, dig the hole deep enough so the graft union is at or above the soil line. In heavy clay soils, consider mounding up the soil to plant the rose a little higher. 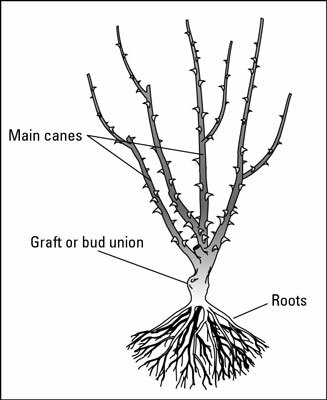 The graft union is where the rose variety with the desired flower habit is grafted onto a rootstock with the desired hardiness, disease resistance, and vigor. It’s important that this union not fail, or only the rootstock variety will grow, meaning a different colored flower or no flowers for your rose. Credit: Illustration by Ron Hildebrand. Amend the soil with compost. Create a volcano-like cone from the soil and compost for bare root roses; you need to drape the roots over the cone when planting. Position the rose in the hole and backfill the hole with the native soil you dug out of the soil. Drape the roots of your bare root rose over the soil cone you made in Step 4. If you’re planting a container rose, just place it in the hole. Again, if you have poor native soil, amend it with topsoil and compost. Add water as you backfill the hole to remove any air pockets. Reposition the rose if it has sunk during the backfilling process. As with trees and shrubs, create a basin around the planting hole to fill with water. Add bark mulch around the rose, keeping it away from the rose canes so they don’t rot. If cold weather threatens in spring, cover the graft union with bark mulch to protect it. After the weather is consistently warm, remove this extra mulch. To make growing roses a little easier, try growing non-grafted or own–root roses. These roses have been bred to the desired characteristics on their own rootstocks. The main advantage of planting these roses is that if the rose top dies back for any reason, the shoots that re-grow from the roots will be the same variety as the original top. You don’t have to worry about graft unions.